The following text is taken from the Vectrex technical manual. As a general description, the HP3OOO is a self-contained video game system intended for home use. The system includes its own 9" B&W monitor screen and 3" permanent magnet speaker. Plug-in ROM type cartridges are available offering arcade type video and sound game play. No external TV receiver hookup is needed or provided for. A front panel storable controller allows control over the game via joystick and push button action switches. For two player operation a second controller identical to the single player controller is available as an accessory product. Both controllers attach to the main game console through nine wire coiled telephone style cables. There is a consumer power switch/volume control on the front panel as well as a game reset button. A consumer adjustable brightness control is located on the main console rear housing. For the technical description which follows, the reader is encouraged to refer to the block diagram and schematic [see the technical manual]. The HP3OOO is a microprocessor based, vector scan system using a standard 9" black & white CRT as its video display device. The microprocessor (MPU) is the Motorola 68A09 device. The MPU operates at 1.6 MHz from a 6 MHz external Xtal. An internal divide by 4 circuit generates the MPU 1.6 MHz "E" clock signal used in the system. Program memory is stored in the 8K x 8 bit 2363 type ROM. This ROM contains common subroutines, the "executive" or assembler instructions plus one complete game. Two 1K x 4 bit 2114 type static RAMS provide storage locations for data indicative of locations of objects, game status, and various other information needed by the microprocessor during game operation. Peripheral Interface Adaptor (PIA) Chip, has two 8 bit peripheral ports which interfaces the MPU with peripheral devices and external signals. One of the PIA ports interfaces the General Instrument AY-3-8912 sound-I.O. chip with the MPU and also drives the digital to analog converter chip MC1408. The other PIA port is used as control lines for the sound chip, selector control for the multiplex chip and as a means to read the A/D comparator that's used in the joystick successive approximation circuitry. Sound is either MPU generated directly or by use of the AY-3-8912 sound chip. The AY-3-8912 sound chip is a programmable sound generator containing 3 tone generators and wave shaping circuitry. This chip also has a single 8 bit I.O. port used to read the status of each of the hand controller's 4 action switches. The standard TTL device types 74LS00 and 74LS32 are used as control line decoders to allow the MPU to select the appropriate circuit element to be addressed at any particular time. The analog processing section includes digital to analog converter (DAC) chip type MC1408, dual 4 channel multiplexer/demultiplexer chip type CD4052, and dual channel op-amps types LF353 and LF347. DAC chip MC1408 receives an 8 bit word at data terminals D0-D7. DAC output (pin 4) is current source. One section of IC LF353 is used to change this current to a voltage representative of the 8 bit digital word received by the DAC chip. The LF353 voltage is applied to an input of the dual 4 channel multiplexer (MUX) chip CD4052. This same voltage (designated "DAC" on the schematic) is the X-axis drive signal. The CD4052 MUX chip serves two purposes: it selectively couples, under MPU control, the output of the DAC current/voltage converter to one of 4 places and is used to selectively couple the inputs from the joystick pots to the voltage comparator IC LF353. The following information was extracted from the Vectrex technical manual. I have re-drawn the schematic and added the table to make it easier to understand. If you have a basic understanding of electronics you should be able to convert another joystick to use with the Vectrex without too much trouble. The Following information was taken from a text file on the Vectrex FTP site. I cannot credit the author as no details were given. 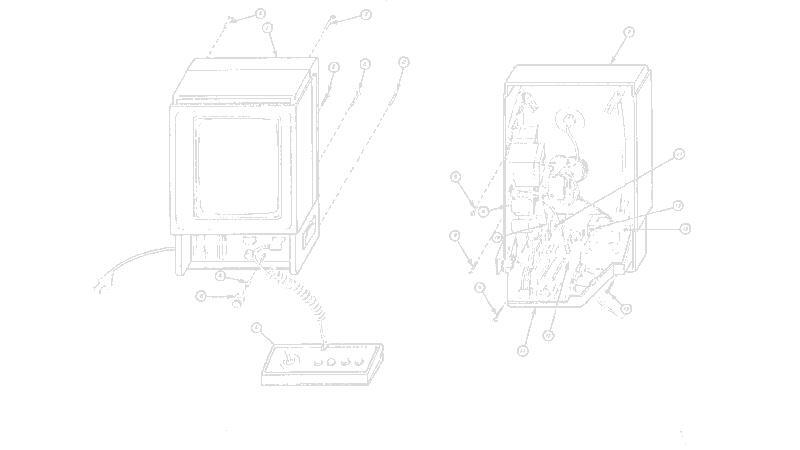 The following schematic was taken from a file on the Vectrex FTP site. well with the vectrex. This is NOT the official vectrex lightpen. 0) Not the official Vectrex lightpen. 4) Use Seqa extension cable (with plug cut off) to make connection to vectrex. The following information on how the light pen works was taken from the readme file included with DVE 1.4. It is written by the emulators current maintainer, Chris Salamon. Finally i've got hold of a complete set of decent quality scans of the Vectrex Technical Manual. The zip contains large BMP files of all the pages (including the front cover!). Be warned though, it's a pretty big file (over 6 meg) and the whole lot unzips to over 100 meg! !